Abstract: Endophthalmitis following intraocular surgery can be devastating. This case report demonstrates successful management of late-onset Streptococcus mitis endophthalmitis treated by vitrectomy, panretinal photocoagulation (PRP) and silicone oil tamponade. A 75-year-old man presented with painful vision loss in his right eye. 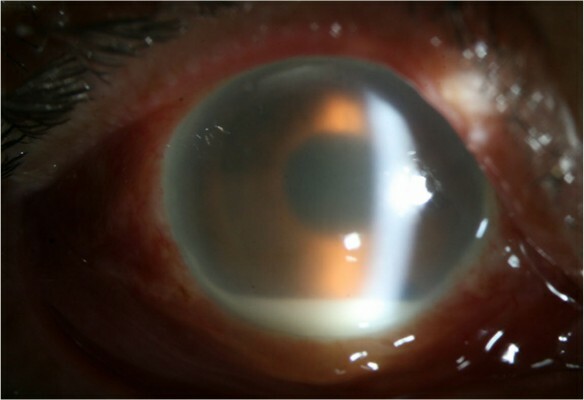 The patient had uneventful phacoemulsification and intraocular lens implantation in the right eye at an outside clinic 6 weeks prior. Examination disclosed hypopyon and vitritis, as well as discrete inflammatory collections in the vitreous. The patient underwent vitrectomy with PRP and silicone oil tamponade. Vitreous cultures were positive for S. mitis, a pathogen associated with severe tissue damage and poor clinical outcomes. One month after the surgery, intraocular inflammation was stabilized, and visual acuity was improved from light perception to 20/200. Aggressive surgical management may play a role in improving outcomes in these patients.